The Ange S Karabiner represents the middle ground between the traditional gate karabiner and the classic wire gate karabiner. It combines the fluidity of the spring gate with the lightness of the wire gate system. 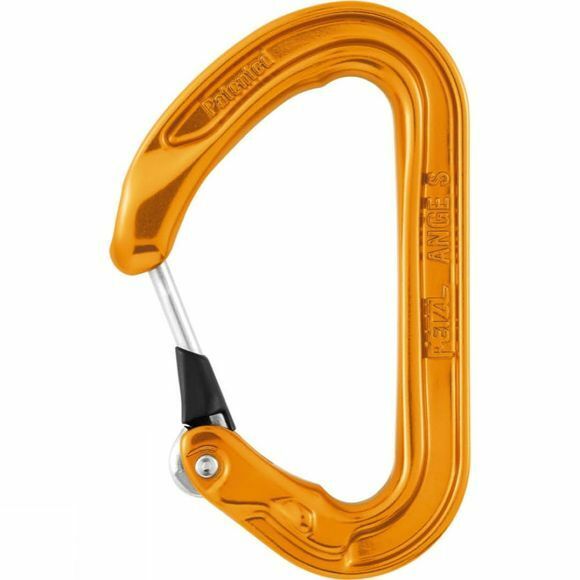 Petzl's MonoFil Keylock technology and the H-profile give the Ange S a weight of just 28 grams and an optimal weight-to-strength ratio. It is particularly suitable for climbers looking to reduce their weight to a minimum. The shape of the nose is designed to optimize clipping and unclipping while a hole in the nose allows ice, snow or dirt to be cleared out. Petzl's MonoFil Keylock ensures smoother opening and closing of the karabiner and a much longer lifetime compared to traditional wire gate karabiners. The wire gate is protected from lateral rubbing against rock. An indent on the bottom of the karabiner helps keep the string in place so that the sling is properly positioned on the karabiner. The surfaces that come in contact with the rope and with the anchor are wider, for better rope glide and reduced karabiner wear. The deflector works with the shape of the karabiner to promote proper positioning of the karabiner on its major axis.